New Heads Have Arrived. Now I just need to get them in there. In the meantime I thought I'd show off the new heads that are going on the car. Driver side one, was built by and courtesy of Don's Corvairs of Visalia, CA. Passenger side one, was a gift from Mike Stevens of the San Joaquin Valley Corvair Club (viewmaster here on the forum), and was refurbished & rebuilt by Spanky's Machine Shop here in Porterville--valves and guides brought in from EPWI Warehouse in New Jersey and SI Valves in Simi Valley. The first "top and bottom" picture is of how both heads appear now, all done. The next set of pictures show a comparison of the finished heads with the kind of condition each particular head was in beforehand. Very excited to mount these fire them up! If there's anyone in my area who wants to give me a hand, that'd be great; I'm not very good at lifting heavy things--besides installation of these and putting all of the shrouds back into place properly, is kind of a more than one guy job. Edited 1 time(s). Last edit at 02/08/2019 03:30PM by playerpage. Re: New Heads Have Arrived. Now I just need to get them in there. Those heads look like they are a simple clean-up & valve grinding job. Used valves, used seats and likely used guides. Hopefully you did not spend over $300.00- $400.00 for that kind of work. I'm sure they will be better than what you took off, however, I'd be very concerned about how long they will provide good service. Run high test gas and keep it cool to hedge your bet they won't drop a seat or the guides don't show their wear. Good luck getting her back on the road! Can't vouch beyond what you say for the 'Don's Corvairs' one, but the Spanky's is a complete rebuild. All internal parts are new, including the valve guides. If the work included new deep seats you should get years of worry-free service. If new seats were not installed I would be concerned. 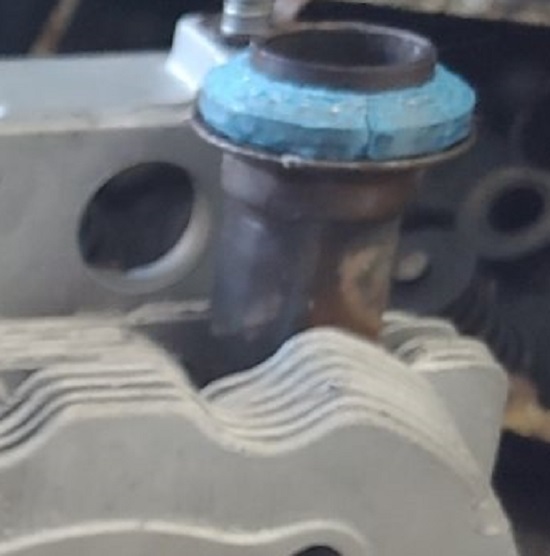 I have replaced a head due to a dropped seat and got one hour down the road and had a another valve seat drop on the other head. That is when I learned there are two types of original Corvair valve seats: 1. those that have dropped; and 2. those that will drop. Of course my experience is with 110 and 140 heads. Way to go, Eric. Hope it all works together, for GOOD!! Is it the photograph or my eyes? Edited 1 time(s). Last edit at 02/11/2019 10:48AM by Richard. I think what you're trying to say is it doesn't look like new exhaust tubes? That is correct. Those are not swapped out. I had to save money somewhere. > look like new exhaust tubes? That is correct. > > look like new exhaust tubes? That is correct. > They don't look clearanced. Yeah!!! Eric, are you gonna be able to slide that head onto the studs?? 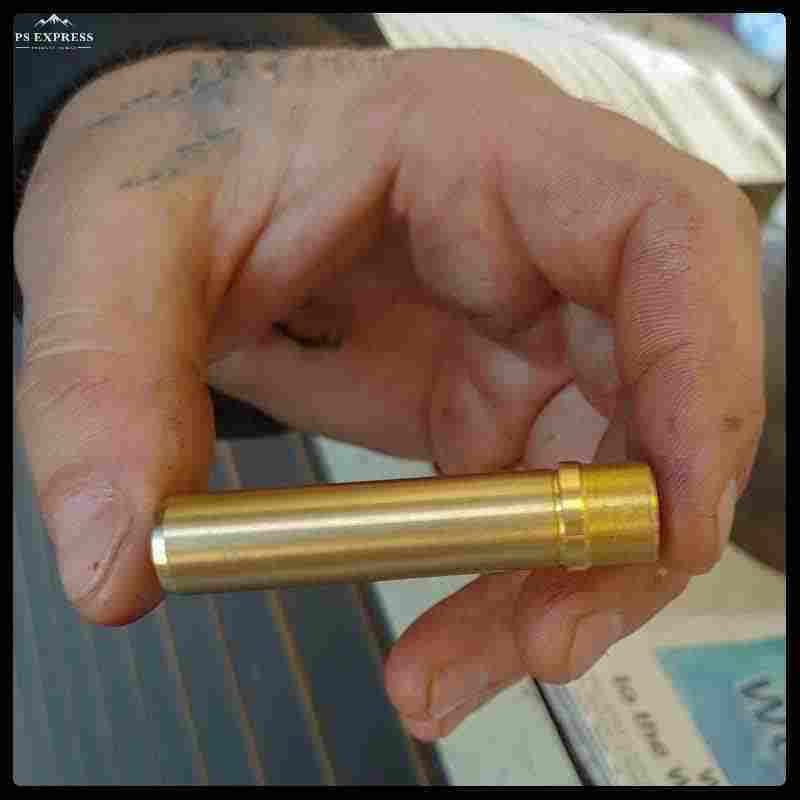 Did your machinist open up those tubes, and get rid of the "dent" in the sides of those exhaust tubes? > > > look like new exhaust tubes? That is correct. > > They don't look clearanced. > sides of those exhaust tubes? Maybe they're turned the wrong way? I don't think they would've taken the time to remove the indention from all of them. I think it was removed and not orientated correctly when installed. JMO. Eric, maybe it is just the lighting in your photo. Try taking a couple more pictures focusing more on the exhaust tubes. I hope it is correct, but they really look wrong in the photo you have posted. Those flats should definitely be lined up with the pushrod tube holes. I see what appears to be 2 redone heads. One is still kinda dirty and the other is so clean that it looks new. 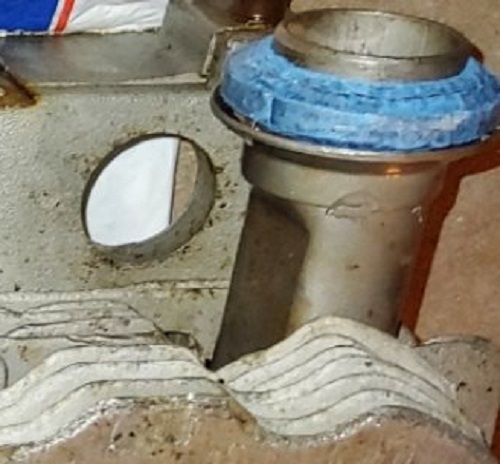 I am assuming one of these is the R and the other is the L. If this is the case I would suggest that the dirty one be taken to a machine shop to be machined in the head gasket seat area to match the clean one. 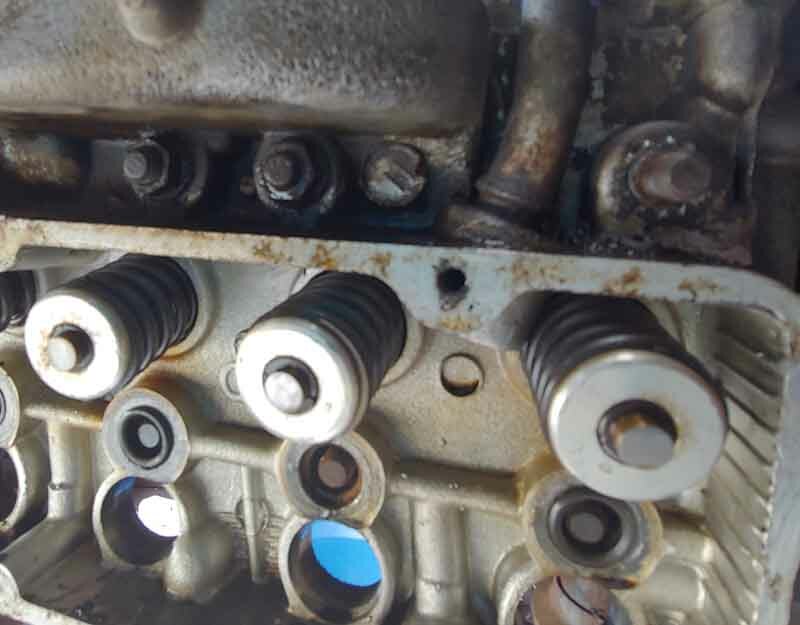 the clean one has had the entire head gasket step machined off the other has a mostly intact head gasket step. 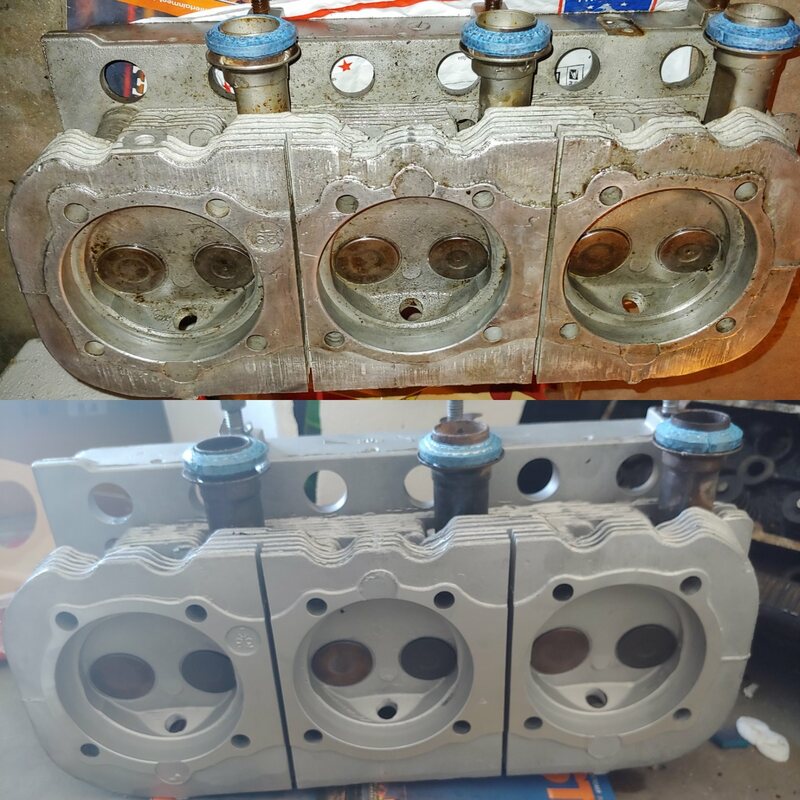 Chamber volumes will be different as will compression if the same thickness head gaskets are used on each side. Can perhaps get close by compensating for the thickness on the dirty head by adding thicker gaskets on the heavily machined head, but, would be best machine the dirty head to match the other one. Ted I am not sure that is the case. It may be just the way it looks in the pic. Look at the amount of material between the spark plug hole and the register. You need to take a caliper and measure the recess to be sure. Plus if that much was removed and nothing taken off the head face the jugs could never reach the gasket register. The far right is the best pic. Those are important issues and I appreciate everyone's bringing them to my attention. The dirtier head is the driver side left hand head and it is the one that was done at Don's Corvair. The right-hand passenger side head was the one professionally machined. The dirtier one has already been installed so do I have to pull it back off to get it machined? Is this a really big issue that could have made trouble when the car got all back together? As for the tubes on the cleaner head they still have the indents but it's very possible that they are not installed correctly. I will double-check that. Lastly, when it comes to removing the old right hand head I have run into a snag. The top row of bolts is very rusted and I was only able to get one off. The others are trying to take the entire bolts off with them. I stopped when that begin to happen but now I'm just scratching my head as to how to remove this thing. I suppose it is good that I haven't gotten too far with the install because of that. Hope you've soaked them with Penetrant!! Right. Nuts. Sheesh on me. I have them soaked in Bolt Buster, I will use the vice grips, but I may find myself in a just-not-coordinated-or-strong-enough situation.